Thank goodness for Gas and Air! I have been meaning to write this for some time now and as I am sitting down to watch this week’s Call the Midwife it seems an appropriate time! It seems to be an obligatory question to ask someone who has had a baby – ‘how was the birth?’ On the whole I smile and say it was quite fun (to their shock!) as I really do have such fond memories – sounds nuts I know because let’s face it I did give birth! Sunday 12th July… I happily sat in Frankie and Benny’s with what can only be described as a dream brunch in front of me (it was 11am)! 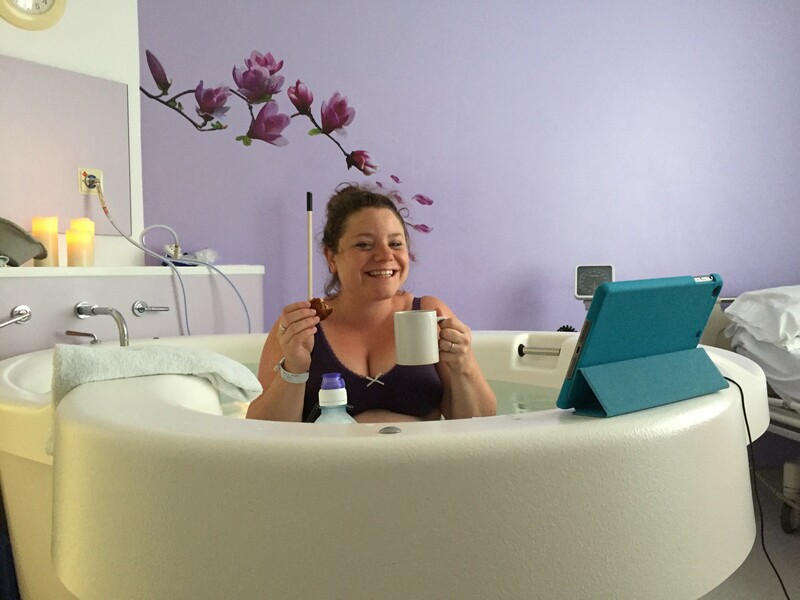 when I got my first contraction – I knew what it was, it was different to the braxton hicks I had experienced. The night before I did feel different, like it was happening soon so I was half expecting it! We got home at 1pm (after a mad dash to borrow an NCT chums Tens machine, which seemingly I didn’t get on with at all). I had a shower, and a bath, desperate to find a position that was comfy – for over an hour I just laid on the landing (possibly the smallest landing ever!) with Oreo (the dog) looking at me in a confused manner while I moaned like mad – it was probably this moment that it started to dawn on me what was going to happen! 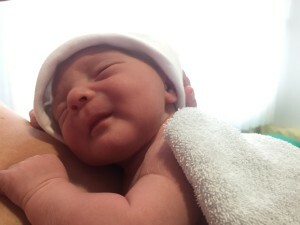 A few hours past and I just became so unsettled at home – I wrote a few emails (yes you read correctly) to clients to explain why I wouldn’t be calling the next day as we had planned (Toby came 10 days early!) and then after a call to the MLU they agreed (having heard my panicked noises) it was time for us to get in! It was 6pm by the time we arrived! My pool was ready and waiting – after an examination, which confirmed I was 3cm dilated, I got in and what a relief that was. We had Friends series 3 on the iPad and to my amazement I was offered tea and toast… it was quite fun – although intermittently ruined by regular minutes of intense pain! Once we were settled and things seemed to be progressing well, Jack and me put bets on – when would the baby arrive? Jack thought 1am and I punted for 3am! What a joke that was! Many, many hours passed… I got in and out the pool, 3 midwives came and went, a lot of gas and air was inhaled, and a fair few terrifying moments happened…. wondering not only how much longer, but also how on earth will this baby get out! Still at this stage I was somewhat perplexed and in denial I would be pushing an actual baby out of me! 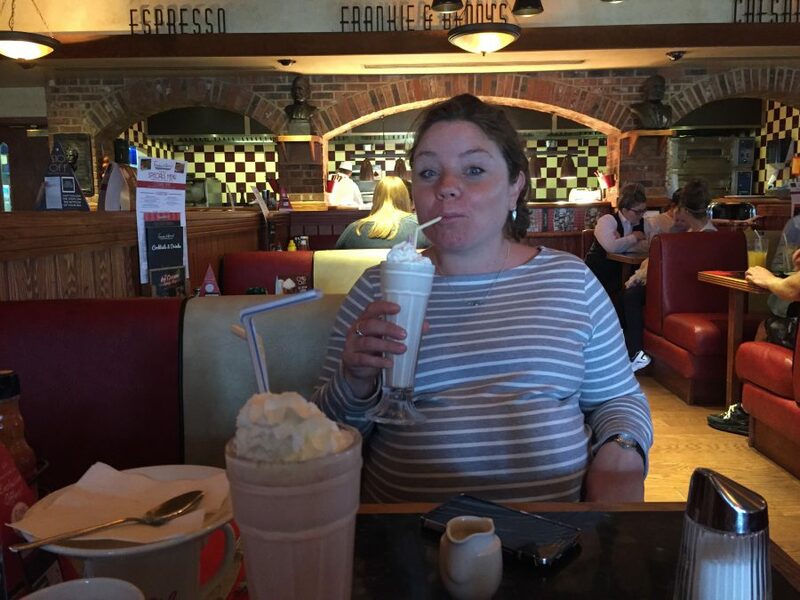 The morning came and still no baby – I was exhausted having been going for nearly 24 hours! The midwife and her student who welcomed us the night before arrived in our room at the start of their next shift. Although this somewhat demoralised me, I was pleased to see the familiar faces as I had grown fond of them! After an examination the midwife, who can only be described as a super hero realised something was not right – she asked me to trust her and allow her to direct me. 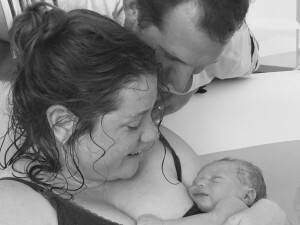 The baby was in the wrong position and as it was I would never have had a natural birth. I truly feel her expertise and knowledge got me the birth I wanted. We did some weird, wonderful and agonising moves – but after over an hour of basically doing head stands the baby had turned and we were ready for the off! It only took him 20 hours to get there! Up until this point I had only been on gas and air… what a miracle that stuff is… I literally wouldn’t let it out of my sight and chewed my way through 4 mouth pieces! However, the many hours so far had taken their toll. I was offered Morphine but kept saying no (I had read about how it can affect the baby) but the midwives explained to me that it might help – let me have a rest before the main event and me and Jack decided it was right. I have no idea what the timings are at this point, but I had an hour or so very much spaced out – going in and out of sleep. Jack tells me during this period of time the midwife wrote him a little note to explain what was going on – it said we still have a few hours left, but you will have a baby by this afternoon. Apparently she didn’t dare tell me this as she worried it would set me back – in my mind I needed the baby to arrive then! I will always thank her for reassuring and supporting Jack. After my morphine induced chill out I had yet another examination. A bit longer and we’d be pushing she said! I got back in the pool and powered through a few more hours of contractions, – the feeling on every contraction that it can’t possibly get more intense – and then it does – will always be firmly imprinted on my memory! So, I pushed and pushed. I will never forget the moment the student (who was the loveliest, happiest lady) was delighted to report to me ‘I can see the head’ – I truly thought she meant the head was out – the whole head… but alas it was just that she could see a teeny bit of the head when I was pushing, before it vanished again! After a rather stern, yet friendly word with her she kept her excitement to herself until it was actually a whole head she could see. Oh my god what an intense and unique feeling. It is impossible to truly describe that moment. The final push was terrifying as his shoulders were stuck, but yet again my midwife was calm and direct and told me what to do – and there he was… this bright purple, alien like, amazing baby, that was all ours who entered the world at 2.43pm on 13th July weighing 7lbs 1. I initially said no to the injection they offer to encourage the after birth (sorry not sure of technical terms!) but wished I hadn’t. 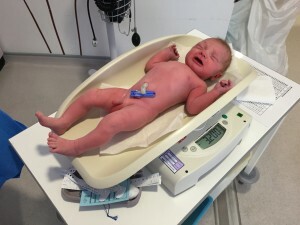 With ten minutes to spare before the midwife warned me they would have to intervene, we had a big panic on to get it out – I had the injection in the end, just in time and all was well! After lots of skin to skin, all the usual bits were done – cord cut, baby weighed and checked and while daddy enjoyed skin to skin I tried to convince the midwife I didn’t need stitches… tried and failed! Well that bit is not fun, but it had to be done. Me and my brand new boy tucked up in the hospital bed while daddy got some much needed food for us – a big mac with fries was on order… well seriously if you can’t eat burger and fries after 27 hours’ hard graft, when can you! Goodness, once you start you just can’t stop – but I will! The days and weeks that followed were equally amazing – for another blog post! All it leaves me to say, in a very Oscar award winning speech like way is… Thank you – Thank you to the midwives and student midwives, thank you to Jack for his unfaltering support and thank you to Toby for arriving in the world without too much pain!! !